§ What am I on about??? Last weekend, I took part in the Pedagoo event #tmlovelibraries. It was a fantastic day, and I learned loads. At the pub session afterwards, there was a sort of TeachMeet Unplugged event, similar in feel to the TeachMeet 365 events or, as Fearghal testified, to the very early TeachMeets themselves. Fearghal had asked us all to come with something we were prepared to share; as I have been doing a bit of work with OpenBadges and have been very impressed with them, I decided that this was what I was going to talk about. Then I hit the problem. 2 minutes is not a very long time, particularly to talk about something you have been working on for months and have found out so much about. So, to keep things short, I decided to create an OpenBadge for all the participants of tmlovelibraries and then give it to them as a present. By claiming it, they could find out a bit about Openbadges themselves. This idea seemed to work well in the keeping things short arena, as well as the engaging the audience area – the word ‘gift’ seemed to be the important one in achieving this! As Fearghal commented on the night, my talk also had the effect of taking his carefully honed structure and blasting it into a million pieces as people went scurrying to the internet to find their badge. The badge is shown below, together with its claim code for anyone who was there. To claim it, navigate to the badg.us site and insert the claim code ‘kapyua’ into the “Claim award from code” box. This will prompt you to either sign in to your Mozilla Backpack if you already have one, or sign up with an email address to create one before awarding you the tmlovelibraries – Participant badge, which you can then display on your blog, Facebook profile or Twitter feed. In the impromptu break that followed my talk, I was talking to a few different people, and realised that there was a real appetite for finding out more about using OpenBadges. Quite a few people had looked at the concept themselves, before deciding that the project was too technical for them to use effectively. This, of course, is exactly the same decision I came to myself when I first started looking into digital badges. 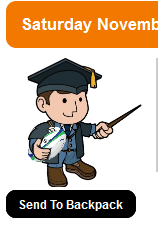 I had been impressed with the ease of creating badges for recognising various achievements on Edmodo, but had hoped for some way to display them in fronter, our school’s virtual learning environment. When I had approached the extremely helpful people at Edmodo asking if this was possible, they said that whilst they were happy for the badges to be displayed elsewhere, but it would need to be purely a case of copying them as an image and uploading them elsewhere. I felt sure that there had to be a more efficient way of doing this, and went off doing a bit of digital badge research. It soon became clear that OpenBadges were exactly what I was looking for, but despite the fact that there were plentiful resources available for those with an ability to code, there was nothing I could find that was very user-friendly for a class teacher. Until I chanced across the ForAllBadges site that is. Straight from the off, ForAllBadges allowed me to create an OpenBadge simply by uploading an image to the site and filling in the information fields to attach to it. Perfect for what I wanted. But ForAllBadges had far more to offer than I had been looking for. It gave me a whole badge-management system, allowing me to upload classes and add staff, create and issue badges and – most crucially given the age of my pupils – a way to display the badges earned without needing a Mozilla Backpack (currently, a Mozilla Backpack is only available to learners over the age of 13). 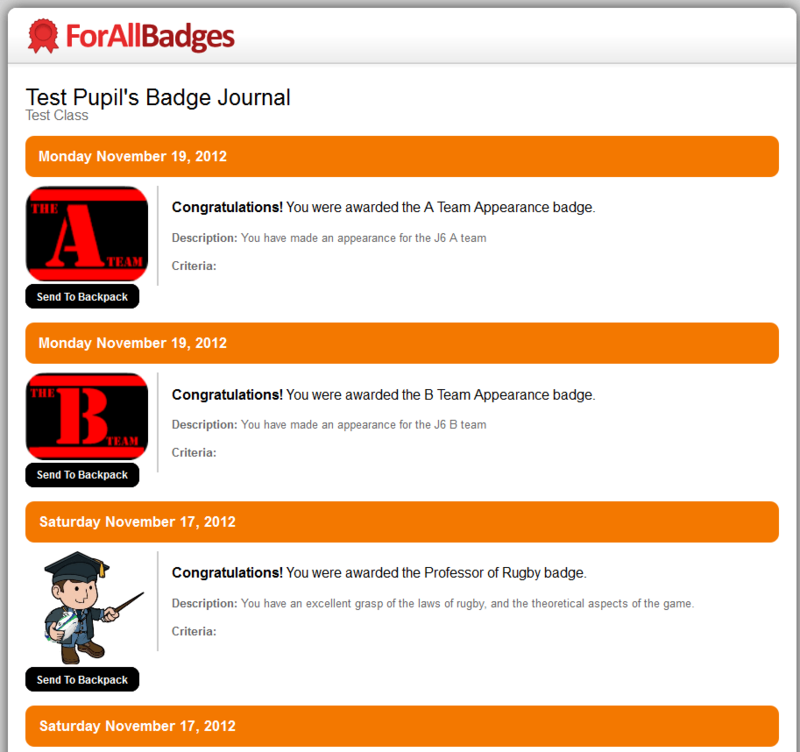 I soon had a pilot badge system up and running and a fronter page created with links to the pupil’s individual Trophy Rooms; here their badges could be seen through viewing their ForAllBadges badge journal. After an email exchange with the amazing people at ForAllBadges, the ability for the student to add a reflective comment to their badge journal was quickly added. This setup now allowed for a badge to be created, issued, displayed and reflected upon as well as having the advantage of being part of the OpenBadge system allowing a great degree of portability for the badges once the pupil reaches the age of 13 (or Mozilla update their terms & conditions to allow under 13s to have a Backpack with permission from their parent/carer – a change that is on the cards very soon I believe). This was perfect for what I was looking to use it for in school, but perhaps a bit too complicated to use in ‘open play’. I had been thinking that OpenBadges could be a great way to document CPD activities such as TeachMeets or MOOCs for example, but how could an event organiser award a badge to someone whose details they didn’t know? Would they have to do all the data-inputting themselves? This sounded like a prohibitive amount of work. Fortunately, a site that David Muir had pointed me towards had the answer. Badg.us allows a user to create badges very simply, and in much the same way as ForAllBadges. However, the badg.us site interfaces drectly with the Mozilla Backpack and Persona sign-in service, making it a far more user-friendly solution when you will be issuing badges to people from outwith your organisation or whose details you are unaware of in advance. It also lightens the administrative burden of issuing badges, as the onus is on the claimant to provide their details. The site allows you to set up reusable codes (like the one above) for large-scale issuing, or one-use codes when you are looking to target your badge claimants more precisely (I used this to create “Presenter” and “Organiser” badges for tmlovelibraries, printed up claim codes for these and gave them to Fearghal to distribute). In my opinion, these tools make the whole process of creating and awarding badges far more accessible to the typical classroom practitioner; teachers who, much like myself and Fearghal, would previously have found the process too technical can use these services to gain the benefits of OpenBadges without having to become coding wizards. Other tools have been developed that can do a similar job – for instance, WPBadger and WPBadgeDisplay allow you to utilise WordPress blogs to issue and display badges whilst OpenBadges.me provides a very useful badge designer for either online use or as a WordPress plugin . Recently, the ForAllBadges site has joined together with its sister site ForAllRubrics, and you can set things up so that once a rubric has been com pleted, an OpenBadge can be awarded automatically. After some late-night Twitter conversations between myself and the founder of ForAllSystems, ForAllRubrics also has built-in links to the CfE Experiences & Outcomes. A very handy teacher toolkit! So, now it begins to get exciting. The badges are no longer a concept. Now that a teacher – or a student? – can create and award these badges, what might they do with them? I have a number of ideas that I’ll be trying in my school, and I know Fearghal had an inclination to use them as part of a programme he delivers at his school (this provoked a very interesting side discussion with David Gilmour about extrinsic/intrinsic motivation). I know that other organisations (including the Scout Association and – believe it or not – the SQA) have been looking at introducing them too. What would you do with OpenBadges? For the last few weeks, I have been looking into OpenBadges as a possible way to recognise achievement and act as a pupil-friendly way of building e-portfolios or profiles. Originally I stumbled upon OpenBadges after being impressed with the badge-awarding mechanism in Edmodo – the social learning network that I had been hearing loads of good things about from Alan Hamilton, Drew Burrett and Charlie Love, amongst others. I saw a huge amount of potential for such a system, but felt to utilise it to its full potential, any badging scheme would have to be compatible with fronter, our school’s VLE/MLE of choice. Being unable to find any details on Edmodo itself as to whether this was possible or not, I got in touch with their very helpful support team who told me they would be delighted for me to display the badges elsewhere, but that there was no actual mechanism to do so. This sent me – naturally – scurrying to Google looking for an alternative. After a very interesting (but ultimately fruitless) diversion through the Peer to Peer University I found out about the OpenBadges project, but could not seem to work out how the badges were issued. Someone pointed me towards the WPBadger and WP Badge Display plug-ins for WordPress, and these look like they could be decent solutions if you were running WordPress. Which we weren’t. Life seemed determined to keep OpenBadges and I separate from each other. And that’s when I found ForAllBadges. Initially, the site seemed tricky to navigate, but once I actually added some people to it it began to make a lot more sense! There are 3 levels of school user – pupil, teacher and adminstrator, for the moment I’m going to focus on the administrator experience. When you log-in, the home page is called “The Badge Board”. This gives you a list of pupils, with the recent badges they have been awarded beside their names (see below). A drop-down menu entitled “Working with”allows you to choose which class is being displayed, whilst clicking on any of the badge thumbnails opens up a pop-up window with the details of that award. Clicking on the “Display Badges” icon in the right hand column takes you into that user’s Badge Journal, where badges awarded are displayed in the order they were awarded with the most recent at the top. The Badge Journal is also where each individual can control which of there badges get pushed to their Backpack, but more on that in a bit. Back to the Badge Board, the “Manage Participants” option allows you to add pupils – either individually or as a group through a neat wee “import roster” trick. The “Manage Badges” option takes you to a screen displaying all the badges you have set up, and is where you can create new badges or change the badge settings. 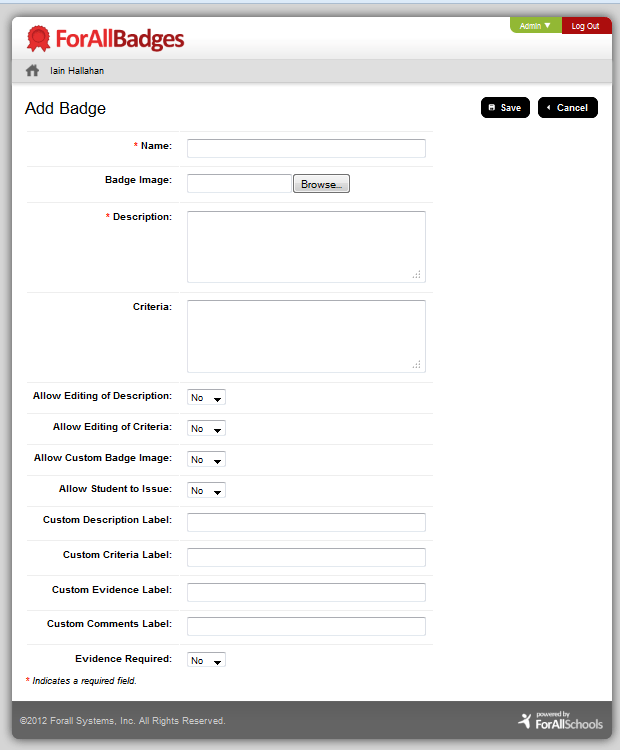 Creating a badge is very easy – when you click on Add badge a form appears (see below) and you simply complete the form and attach a picture and your badge is created automatically. Further adminstrator options are available by selecting the drop down menu in the top right hand corner of the screen, where it says “Admin”. From here you can manage classes (add or delete classes, assign teachers to classes), manage school user accounts (add or delete teachers or administrators) or adjust your own account settings (Email address, password). The whole site is very easy to use and user-friendly. 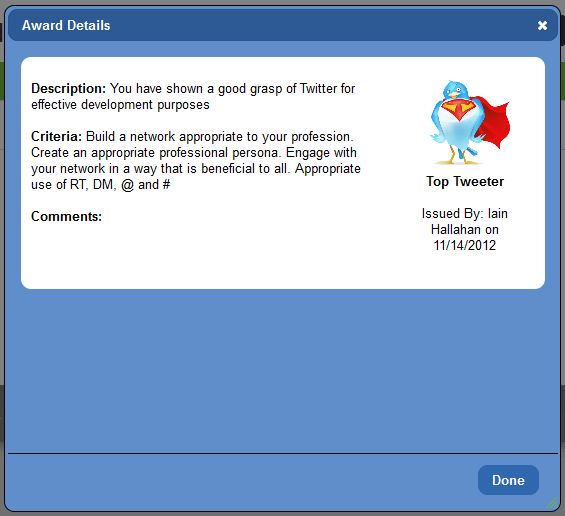 Of course, there would be little point in awarding badges if there was no way to display them. I had been thinking that a WordPress blog might be a good way to display badges. Whilst I have not yet got the WordPress Badge Display plug-in working, Dave Lester who created it has assured me he will give me all the assistance I need to get it up and running properly. In the meantime, I had found a site called BadgeWidgetHack which creates some HTML allowing you to display badges. I cut and pasted this into a text editor in my sidebar, and it worked. Or at least I thought it worked! The esteemed John Johnston, far wiser about such things than I am, quickly spotted that the BadgeWidgetHack code was limited to the most recent 3 badges you had earned. Quicker than I could say “Whit?”, John had the code hacked and a new improved version displaying more (all?) of my badges available. This was all looking good for displaying in WordPress, or anywhere you could edit some HTML, but as I was to find out that was not to be the case in fronter. Whilst you can embed code, it is currently very limited as to where you can embed code from. My solution was looking like setting up a WordPress blog for each user, getting the WP Badge Display plug in working (hopefully) and then displaying this web page inside fronter. Fine as far as it goes, but it sounds like a lot of work for someone. Luckily, before I started building these blogs, it occurred to me that we already had a webpage showing the badges for each user that we could display inside fronter – their Badge Journal page from ForAllBadges. A quick test to check it would work (it did) and suddenly I had a working badge system, from issue to display. In theory at least. Whilst I was trying to think of a small-scale project we could use to test-drive the system, serendipity took a hand. I was talking to a colleague, who as well as being a PE teacher at the school is also my fellow rugby-coach for the P6 boys. He mentioned that he was looking for a way to provide more meaningful and memorable PE feedback to the boys. Any comments he gave them tended to be during drills or in game situations, and he felt this offered little chance for the boys to reflect on his feedback and to improve their performances as a result. I thought that badges sounded like they could be a good fit for what he was hoping to achieve, and he thought it sounded like a good idea. Setting up the ‘live’ system highlighted a few other issues. First of all, I found out that an Administrator on ForAllBadges could not be assigned to a class, and so I used my school email account to set myself a ‘teacher’ account and a non-school email to set myself up as Administrator. Secondly, although adding pupils individually to ForAllBadges required an email, it turned out not to be required if you added them by batch. As we wanted each pupil to be able to see their own Badge Journal but not everbody else’s, I had to create a hidden room for each pupil in fronter which was only accessible by themselves and their teachers/coaches. A ‘Trophy Room’ link in the Rugby Room on fronter takes the pupils to a name board – click on their own name it wil take them into their own trophy room (Badge Journal), click on anyone else’s name, they get the ‘no permissions’ message. The Backpack is your main interface for collecting, managing, grouping and sharing your badges. When you earn badges on participating OBI issuer sites, you can push them directly into your Backpack. You can also import badges stored elsewhere into the Backpack. However, these badges must be OBI compliant as well. The Backpack itself is totally user-driven, and needs no input from the badge-issuer whatsoever. By visiting the OpenBadge Backpack page, anybody can create their own Backpack using only their email address. The system Mozilla use for this is called Persona, and it is a pretty neat piece of software. You can read more about it here. Once signed into your BackPack you can accept (or decline!) badges, and use a simple drag interface to arrange your badges into groups and decide which of them you wish to be available for public display. System wise, that’s about it. Whilst it took a wee while to get things up and running, that was mostly due to the false starts and dead ends. 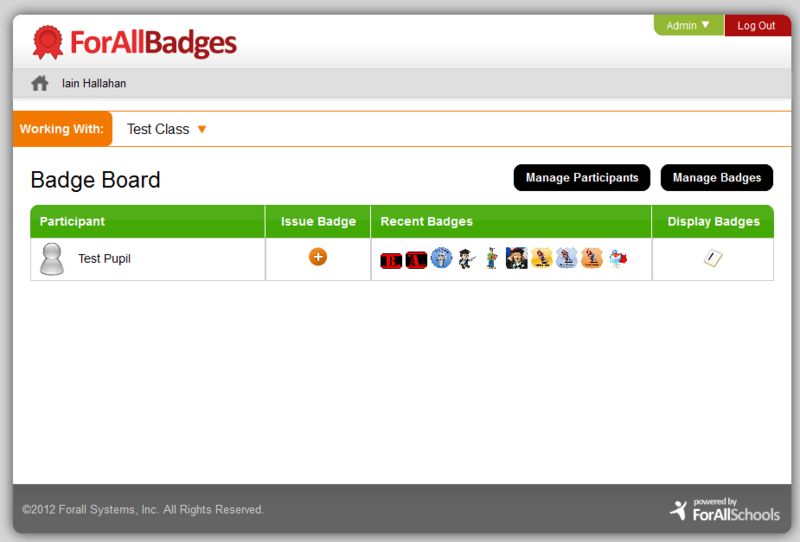 Since finding the ForAllBadges site, everything has been relatively painless. Adding, removing or changing pupils, teachers or admnistrators is straightforward and quick. Creating badges is similarly quick and easy, whilst awarding a badge as a teacher can be as simple as 2 clicks of a mouse. I was concerned about the badges being ‘lost’ to the pupils once they no longer had access to their school email accounts, but a quick chat with Doug Belshaw eased my fears as he assured me that the backpacks will be federated, and as such are flexible, ‘portable’ and future proof. I am very excited to see how the project is received by the pilot group, and am very hopeful that it will strike a chord with them. Should it prove to be a success, I think the badges could be an invaluable tool in profiling/creating portfolios. I look forward to finding out. © The views and opinions expressed in this blog are entirely the author\'s. They are not endorsed by and do not reflect the views of the author\'s employer or any other party.